“What are we going to do about this slope?” is a question we hear often. Many people see slopes as a liability to be overcome, if not ignored. However, hillsides can provide the perfect canvas for a gorgeous landscape. 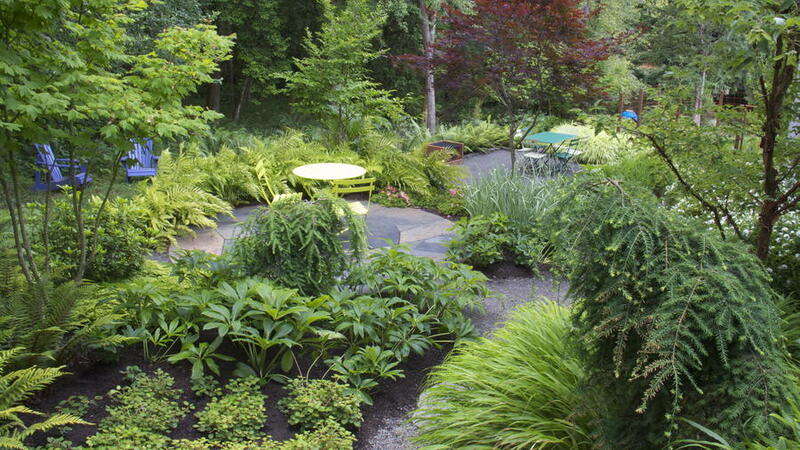 The trick is to use your garden’s topography to your advantage. Hills give a site character and provide an opportunity to create a unique, resilient and beautiful design that could only happen in that place. The first step on any hillside is to correct or eliminate point sources for water, such as downspout outlets. Then, if no retaining is needed, you can grade the soil, plant and mulch. Simple! To reduce foot traffic that could disturb soil and plants, select lower-maintenance varieties. We look for striking foliage texture and color to create a tapestry with few bare spots in the growing season, and save high maintenance perennials for flatter areas and easily accessed edges. This steep hillside faces the front door of our clients’ house, wrapping the entry area in foliage-centric planting and overpowering the broad driveway. If your space has existing walls, ask yourself if they are both necessary and beautiful. You will discover that removing crumbling, unneeded retaining will return the garden to a more natural grade, where the key attributes of your design will take center stage. Removing most of the retaining rocks and re-grading this front yard in Salem, Oregon allowed us to create a sloping garden a with a meditation bench where no one would previously have chosen to sit. Sometimes retaining is necessary to achieve your practical and aesthetic goals. In that case, weave your walls into the natural slope and the overall design. Start by reducing the walls to a workable minimum in height and length. Where possible, echo the lines in other parts of the design and select materials that mirror tones in the nearby garden. The goal is to use each element of your new wall, from material choices to natural slope, to enhance the character and beauty of your garden. The edge of this driveway needs retaining, but the old mortar and rock wall was an eyesore. A new drystack stone wall enhances the peaceful, shady space, located in Eugene, Oregon.